Do you ever need English-speaking vet advice? If so, read on! Well, despite it being the first Sunday of the month, we decided not to open our doors today. We are simply not having enough visitors in this hot weather to justify asking the volunteers, many of whom work full time, to give up their Sunday. The dogs don’t enjoy the heat too much either, so they are best off alone in the shade of their kennels than pushing themselves against the bars of their cages in a desperate attempt to get noticed. So rather than write about dogs, today I am going to write about a new service that may be of interest to some of you. In fact it should be of interest to anyone who has cats or dogs or other domestic pets. I have spoken on a number of occasions about Lisa and Andrew. They have taken SPA puppies to foster (in fact they currently have two, Frank and Betty at their home) They also support the SPA with their catering van at many of our events, and are great friends of the refuge. Lisa is particularly useful as she is a veterinary nurse. She and Andrew have just launched a business to help pet owners in France. This service is not usually available to individuals, but Andrew has negotiated a special deal for Brits living in France. The aim of the service is to provide English speakers in France access to high quality veterinary advice when it is most needed. A dedicated telephone line puts you in touch with a Royal College of Veterinary Surgeons registered veterinary nurse. This can avoid a costly (and often unnecessary) trip to a French vet, and is particularly useful to people who struggle with the language. The service costs just €65 for a full year’s membership, or € 4.50 if paid by direct debit (a 16% saving). As I know from experience, a single out of hours emergency visit to the vet can cost this much, and being an over-protective mum, I have made several visits for my four dogs only to be told that everything is normal. Best of all, for every person who subscribes via a referral from the SPA, Andrew will make a donation to the SPA. 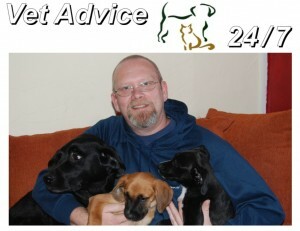 The website is http://www.vetadvice247.com Have a look for yourself. And if you subscribe, please don’t forget to say you found them thanks to the SPA. Here is Andrew with their lab, Mr Bumble and the two foster pups, Frank and Betty. Sometimes things happen that just help to restore your faith in humankind. Today three puppies were adopted, but tonight’s blog concerns one of these adoptions in particular. 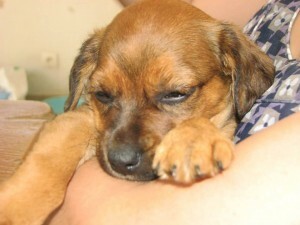 I have told you about our wonderful fostering system, and how these families help puppies on their way to a better life. Some puppies are already badly traumatised by the time they reach us, and it is heart-breaking to think what these dogs must have been through at so young an age. 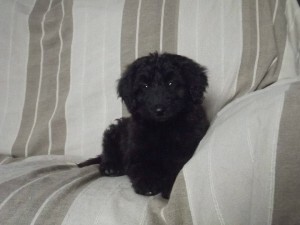 One such pup is Aby, who arrived at the SPA on July 10th. She was just three months old at the time, but had clearly been beaten and was scared of her own shadow. Direct action came in the form of Carole, the SPA secretary, who took Aby home to live with her 3 dogs, 4 (I think) cats, husband and two children, one of whom is four years old and the other is a babe in arms. Since then Aby has progressed enormously, as was expected. However the family are just a week away from leaving for a week’s holiday, and were desperate that Aby be homed beforehand, as opposed to coming to the refuge. An appeal was put out on Facebook this morning, and a family who just happened to be in Carcassonne from their home in Marseille came to meet Aby. They had already adopted a dog from the SPA, and she came along to see what her new pal was like. It was love at first sight, and after a short walk to see how Aby behaved when out of the refuge, off she went! Sometimes it is just a question of timing, but Aby has been so lucky, finding a family with children and another dog to play with. She trotted off happily, leaving a tearful but happy Carole in her wake. The other lucky pups were Belle and Idefix, but don’t despair, we have plenty more pups, as well as adult dogs of all shapes and sizes! Four lucky dogs left the refuge today. Firstly was Bill, the young Podenco. I am delighted that he has found a home, as he has been with us for 6 weeks. That may not sound like very long, but he was just four and a half months old when he arrived, so for him it was quite long enough. Second to leave was Amelie. 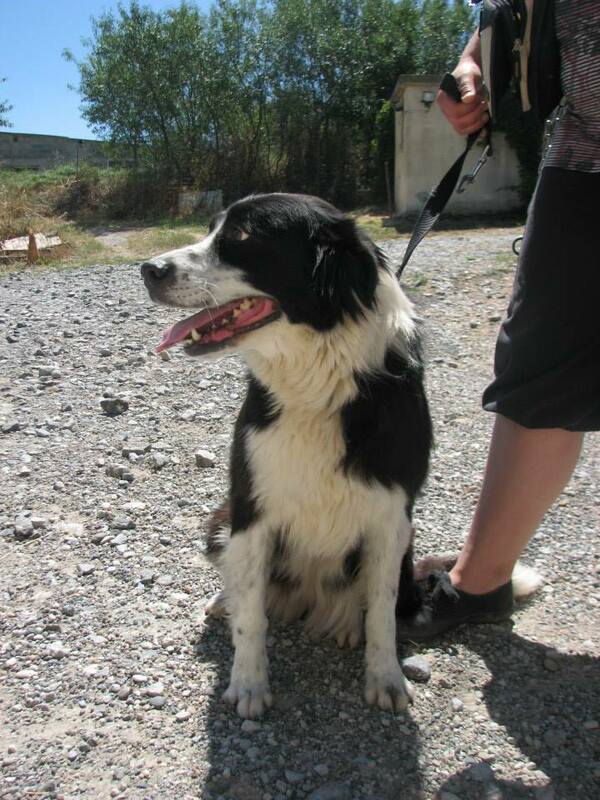 She is a beautiful border collie who arrived at the refuge at the end of May. In fact the people who adopted her today were her original owners, but as their details were not up to date on the register in Paris we had no way of getting in touch with them. We published her photo all over the internet, but no one came forward for her. 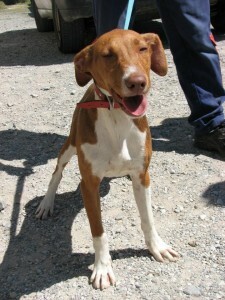 This meant that Amelie had defaulted to belonging to the refuge, and so the couple paid a normal adoption fee. Still 120 euros for 10 weeks kennelling is not bad. ..Am I becoming cynical at all, do you think? 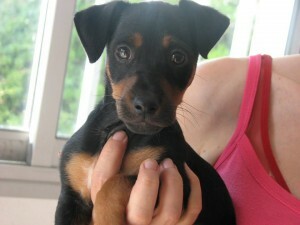 Next out was little Angel, a puppy who has been with us for a month. He came in at eight weeks old, and although I am delighted that he has found a home, it is awful to think of him being found lost and alone at such a young age. Why don’t people sterilise their dogs? Then the adoption of the day. Some dogs are easier to home than others, and the dogs I would put in the “difficult” category are hunt type dogs. Even when they are clearly poor hunters (otherwise they wouldn’t be with us; a good hunter is valuable). 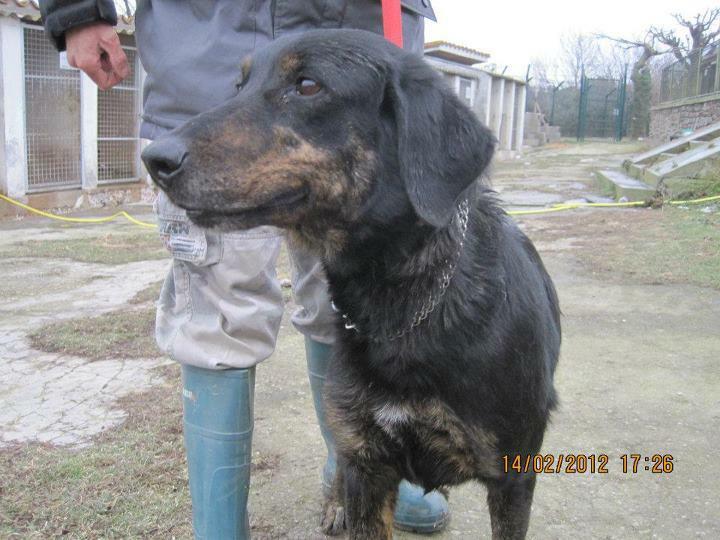 In any case, in mid-January one of our volunteers brought us two exhausted chasse dogs who had been lying in a ditch. As a volunteer it is never easy bringing a dog to the refuge, but of course, as yesterday’s blog illustrates, we are but the stepping stone to a better life. Today the first of the sisters, Maisie, was adopted. She was the kennel mate of Tesson and it strikes me as more than coincidence that she should be adopted so soon after Tesson left. Sometimes changing a kennel or kennel mate can give a dog the exposure he or she needs to be noticed. 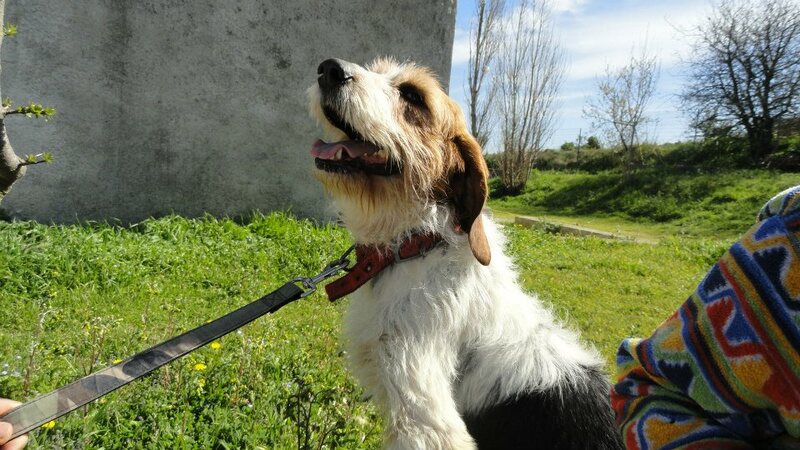 Tesson’s adopter, who walked him regularly before the adoption took place, often took Maisie out for a stroll. She became better and better on the lead, and I am sure this helped her on her way, too. Thanks Jeremy. Not every day can be filled with good news, but sometimes we take solace from aspects of the SPA’s work other than adoptions. Today’s blog is dedicated to Hoffen, who arrived with us 4 weeks ago in a terrible state. He is a Pyrenean Mountain dog, but it was difficult to see this when he arrived. An adult male of this breed should weigh about 50kg. When Hoffen arrived he weighed just 26kg. His toenails were very long, and you could see, as well as feel, every single one of his ribs. He was too thin to vaccinate, so instead he went on a programme of eating little and often. This is time- consuming for the employees who have plenty of other duties to keep them busy. But their efforts have paid off. 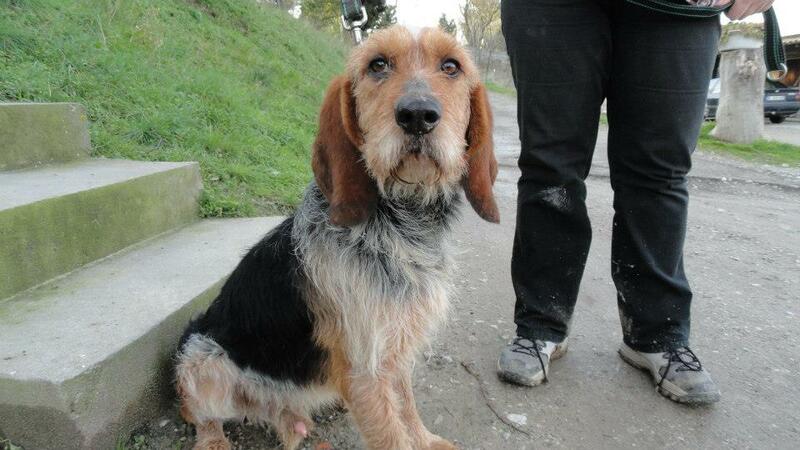 Yesterday Hoffen saw the vet for his 2nd vaccination, and he weighed in at 40 kg. And his toenails have retracted of their own accord (which the vet told us would happen, starvation forces them out of the body, which I didn’t know). Hoffen is looking healthy and happy, and no one can tell me that this dog was better off before he arrived at the SPA. 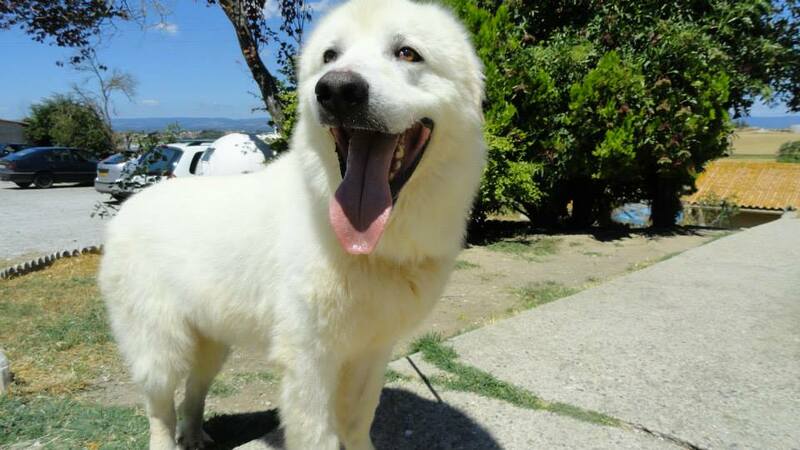 Some of you may know that Hoffen is German for “to hope”, and our wish is that this beautiful boy finds a home where he can continue with his dramatic recovery. I will certainly let you know when this happens, and if you think you might like to adopt this lovely dog, please get in touch. News of an old, old friend! Today wasn’t all good, with the arrival of four more dogs, one of whom is in a terrible condition and only one of whom is micro-chipped. However a couple of things have helped raise morale. 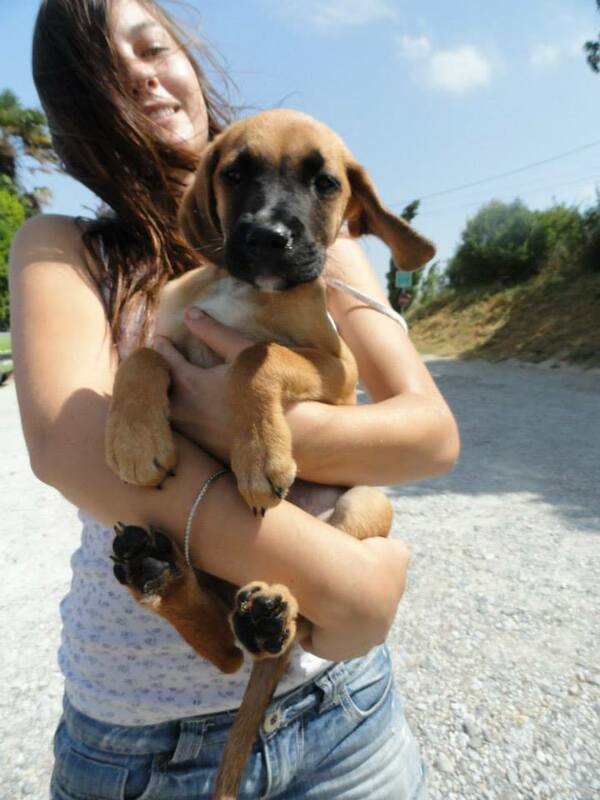 Firstly was the decision by his foster family to adopt Phoebus, the puppy they have been looking after. This wasn’t exactly a given, as the couple have two dogs already, but having seen the photos they took of him while he was in their care (a week’s holiday on the beach, no less), it was clear that they were becoming very attached to him. 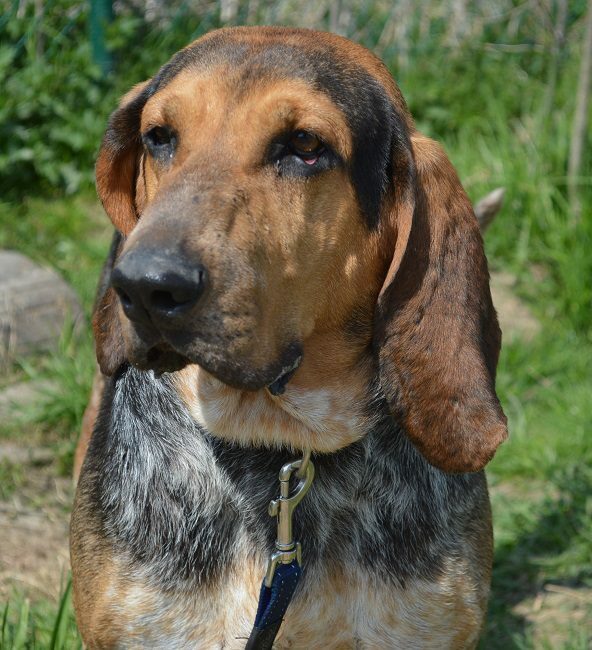 A foster family has been lost, but another dog has been homed. So good news! 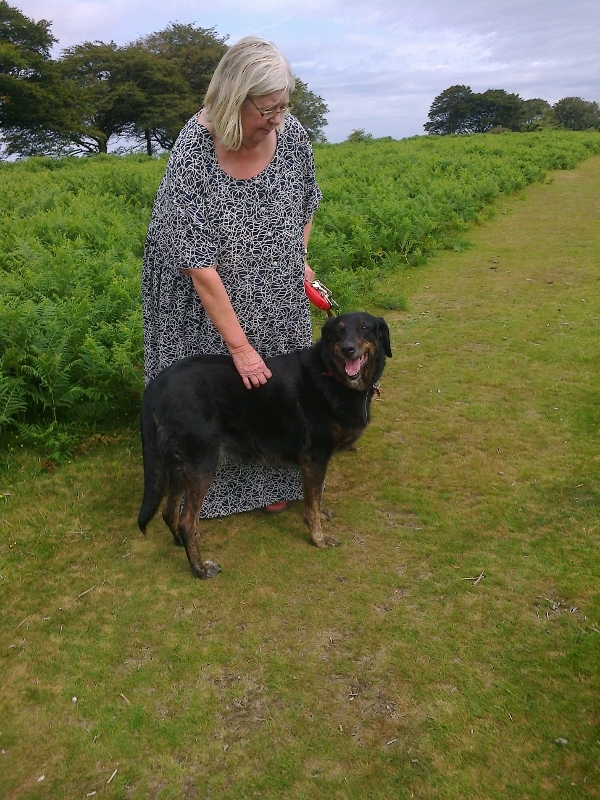 Then (and especially for Carole), I received a lovely photo today of Ebony, who was adopted from the SPA (where she was called Ebene) about eight months ago as an old arthritic lady (I am talking about the dog, not the adopter). She is in England now, and has come on leaps and bounds. As you can see from the photos she is looking healthy and gleaming. Her muscle tone has improved enormously thanks to a mixture of physiotherapy and water aerobics and she now only refuses to put her back leg on the ground when she is running at speed. We have Doglinks to thank for this one too, and Ebony’s owner is planning on helping more elderly dogs when she makes the move to France. Hurry up Elaine, we need you! Well this has certainly been a week which we will never forget! Yesterday Darcey told you about Goudas adoption and today I have even more good news…Harley has a home to call his own, he was adopted today!! Harley arrived at the refuge in February last year. The refuge is a stressful place for dogs and the noise of 130+ dogs is enough to push the most balanced dog over the edge and poor Harley did not cope well with refuge life. He hid at the back of his kennel, much too scared to venture to the front to greet prospective adopters! On his walks away from the refuge a very different dog emerged and ever so slowly we began to see the relaxed , affectionate side of Harley. It was heart breaking to then have to return him to his kennel but such is the reality of life for far too many refuge dogs in France. When Harley was adopted earlier this year we were all over the moon and so happy for both him and his new mum. Such elation was however short lived and he was returned to us a few weeks later as he howled and barked when left alone. His new mum lived in an apartment and her neighbors were not impressed with his constant barking whilst she was at work. Luckily James and Rebecca, a super young couple who volunteer for us agreed to foster Harley whilst we looked for a forever home for him. When dogs are fostered it gives us the perfect opportunity to assess their needs and Harley did have specific needs! He really didn’t like being alone,only really relaxing when right at someone’s side and also became a bit reactive on the leash whilst near male dogs. We also discovered that he really didn’t like rabbits and as James and Rebecca have 3 house rabbits we thought it prudent to move him to another foster family as quickly as possible!. Lucie, her hubby and 3 children are one of our most experienced foster families and we were delighted that they agreed to look after Harley. Lucie also has a young Beauceron pup and numerous cats so Harley was in for lots of fun! He settled well with Lucie and having her dog for company did help his separation issues but Lucie was going back to England in July and they couldn’t take Harley with them. The thought of Harley returning to the refuge was just too much and once again James and Rebecca stepped up and fostered him whilst we looked for a home for him! 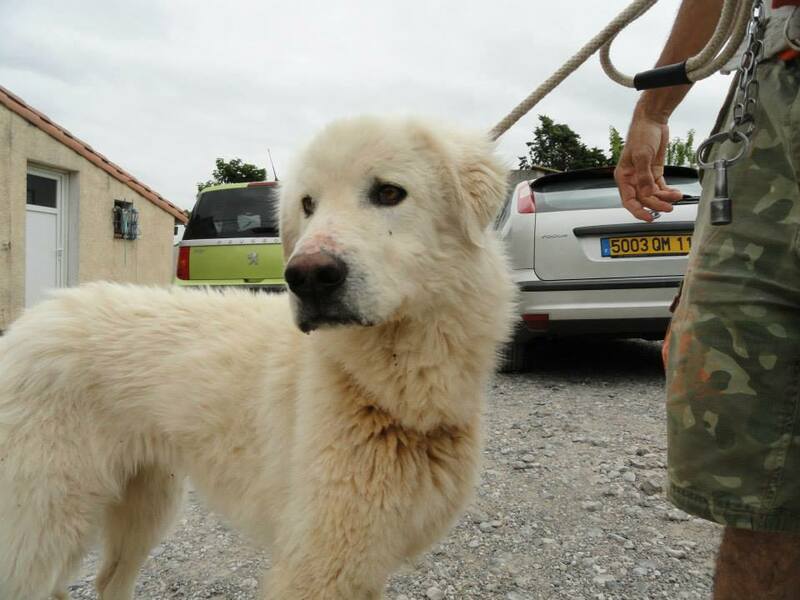 Dog Links is an organisation in France which connects dogs in need with people looking for a dog. This is a God send for refuges like ours and Evelyn from Dog Links worked tirelessly searching for a family for Harley and her hard work has certainly paid off! Bill, a recently retired gentleman who has not long relocated to France read about Harley and today, after many chats, photos and emails Bill came to meet Harley. Like estate agents say there is a buyer for every house, Bill has proved that there is an owner for every dog. It was love at first sight and apart from popping out to the shops for groceries there will be no need for Harley to be alone ever again! 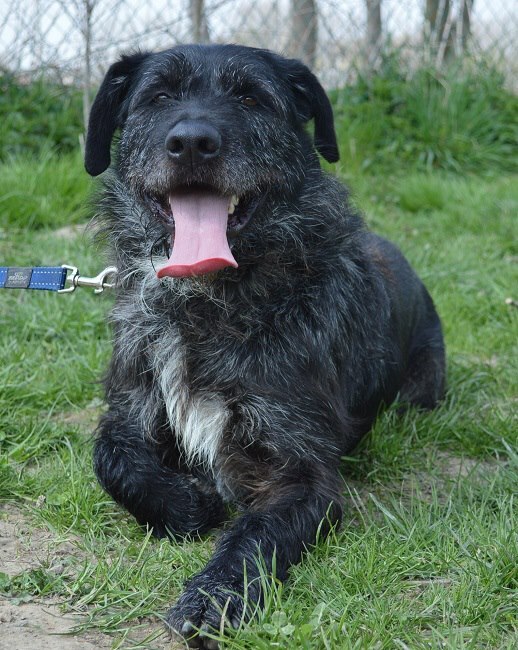 Bill too needs a companion, someone to share long walks with and he cant wait to have Harley curled up on the sofa beside him at night. Bill has no more desire to leave Harley than Harley has to be left so its really a match made in heaven. After a long chat and a nice walk off they went, happy to be together. I am sure Harley will agree that such a future was well worth the wait! Any adoption from the refuge is good news, but some are more so than others. And today I am over the moon at the departure of one of our most deserving dogs. Ladies and gentlemen, I am delighted to announce the adoption of Gouda. He arrived in January this year when he was just four months old. This is a bad age for a dog. No longer a puppy, but with no training and without the calmness of an older dog, his former owners had clearly decided that he was not right for them. Heaven forbid that they should take him to dog training school or make any attempt to educate him. Far easier to dump him and let him make his way to the refuge, if he wasn’t run over in the meantime, that is. Our litters of puppies are often named according to a theme, and I have often joked that Gouda was the last of the puppies from the “Cheese litter”, but in fact he arrived alone, so there are no dogs out there called Emmental or Camembert, although it is an idea! Gouda was adopted briefly (for one night) in March. He was intended as a present for someone’s parents, but the following day he was returned, as the parents had already “ordered” a dog from a breeder. I was heartbroken for Gouda, and he must have wondered what he had done wrong. Four months further down the line and at the age of eleven months, he has been adopted again, and this time it looks good. The whole family came to meet their future dog, so now Gouda will be busy being spoilt by parents, children and grandchildren. I really hope they send us photos. We will have to find a new friend for Eclair, Gouda has been a very good kennel mate to this dog who arrived so nervous and is now far more confident. Well, after I had published my blog yesterday we received some more good news. Many of you will be aware that we have an excellent relationship with a Belgian refuge called Animal Trust (http://www.animaltrust.be/). 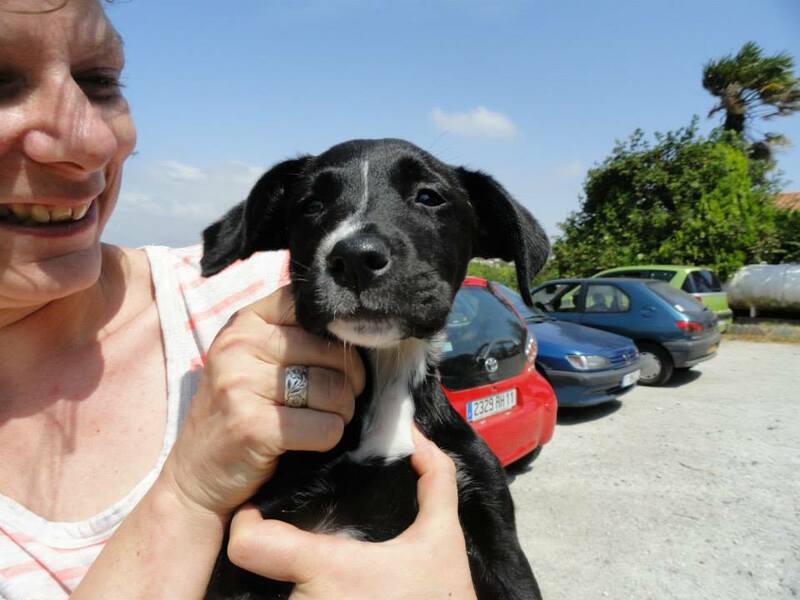 In April with the help of Sarah, a volunteer at both refuges, five dogs who had little chance of being homed from the SPA Carcassonne went off to try their luck at Eline’s wonderful sanctuary. I went to see them last month and you may remember that a few days later, Carbon was homed. 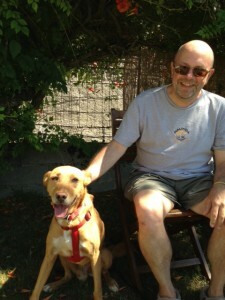 Well yesterday both Murphy and Pepere found homes! Although I adored Pepere and am delighted for him, the adoption of Murphy rates far higher on the good news scale. 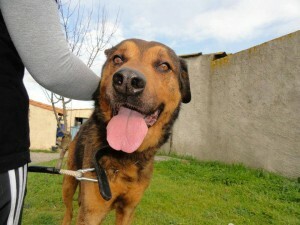 This dog had spent two years in the refuge in Narbonne. They have a much smaller capacity than us and when they found themselves overloaded a couple of years ago, we took Murphy along with several other dogs. We had no luck homing him either, but yesterday he charmed the socks off a couple and their female lab and two grown up children. 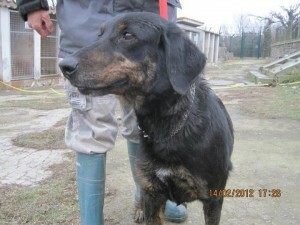 Fabulous news and wonderful that after so long in refuges various, this lovely dog has finally found a home. For me it shows that there is the right home for every dog and that euthanasia for lack of space is the worst option. Have said that, an article published yesterday makes it clear why some shelters have to resort to this. According to La Depeche, France leads the European league in terms of euthanasia. Over 50,000 per year. (http://www.ladepeche.fr/article/2009/05/27/612939-la-france-detient-le-record-de-l-euthanasie-animale.html) Refuges, including the SPA Carcassonne, are overflowing. Our SPA never resorts to threats in order to morally blackmail people to adopt a certain dog, because for us euthanasia due to lack of space can be avoided (providing dogs are neutered, of course! 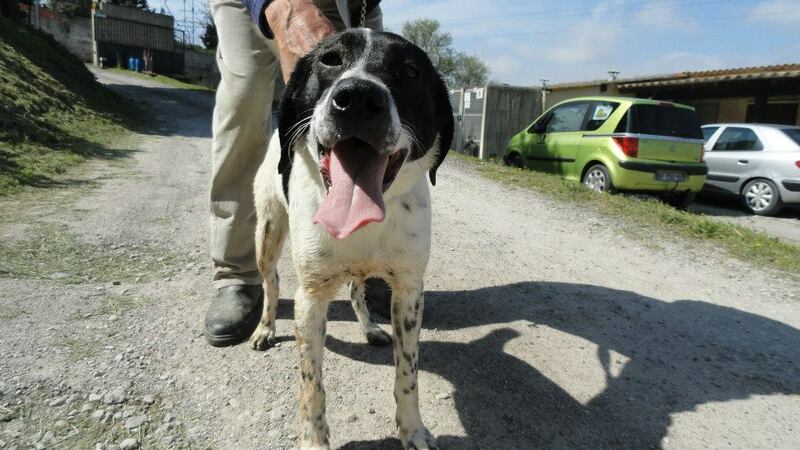 ), but I can understand the desperation of other refuges, as more and more dogs and cats are abandoned. As summer continues things are just getting worse. Lifelines such as that provided by Animal Trust are invaluable and I implore refuges and associations to work together to overcome the current crisis. A short term solution such as fostering is often all that is needed. Once a dog has been euthanized there is no going back. But my biggest plea goes to everyone who has an un-neutered animal. Please sterilise your dog or cat unless you are a registered and responsible breeder. That will make the biggest difference of all. Pepere is adopted from Animal Trust. And Murphy leaves too, after three years of refuge life. Thank you to Eline and her wonderful team. The day started badly with the arrival of two new puppies. Luckily trusty Lisa was on hand to collect them for fostering. They are about 7 weeks old, one boy, one girl, and have now been named Frank and Betty. Both are adorable, naturally! Where would we be without our foster carers? Then things started improving, at least I think it was an improvement. The owner came to collect one of our little yorkies. She has a hugely long name which tells of her good breeding, so it is strange that her owners let her get into such poor condition. We asked them to take her to the vet and to the grooming parlour, but who knows if they will do so. At least she is out of the heat of the refuge, though. Much more positively a family came to adopt one of our beauceron puppies, Bonny, and another family adopted Trust, a puppy who has been in foster care. 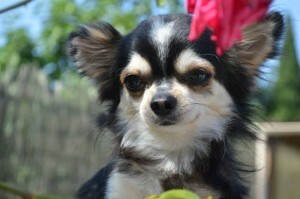 Then just before closing time a family came to adopt Bogoss, a Chihuahua who has also been in foster care. So it really was a day for small dogs, although clearly Bonny is not going to remain small for long! The SPA treasurer arrived and I managed cheer her up by handing over the money that had been raised by Karen and John at their fundraiser on July 20th. It is not often that I make the treasurer smile, and I didn’t even have a camera handy. Karen had requested that some of the money be used to castrate male dogs who cannot be mixed with other males, so several appointments were made at the vets. With any luck we will be able to mix these dogs with females afterwards and their lives will be much more fun. Thanks again Karen and John. And good bye to Trust…. Adoption of an oldie and information that may be useful to some. Several people have contacted me to tell me of their heartbreak when they have been “forced” to give back to its owners a dog which they have looked after for several months. This applies to dogs that are identified (by either microchip or tattoo). A non- identified dog can be identified in your name immediately by any vet, although I think it is only fair to at least attempt to find the owner by informing your local SPA and the local Mairie, and maybe even putting up posters locally, but that is a matter of discretion. For an identified dog there are two possibilities. You either bring it to your local SPA, who will either keep it for ten days and then call you to come and adopt him properly (let them know you want him, though!). Some SPA’s (like the SPA Carcassonne) will often let you keep the dog at your house, but it is worth bearing in mind that you can become terribly attached in 10 days, and so sometimes it is best to leave the dog in the refuge, especially if you have children. The second option (and if you don’t want to pay SPA adoption fees), is to take the dog to a vet and request that he notify the SCC (Societe Central Canine) in Paris that the dog has been found. This gives the owners a chance to find him, and is ultimately the reason for getting an animal identified. If they haven’t contacted the SCC to reclaim their dog after 15 days, ask your vet to change the ownership details. This will cost you a whole 5 euros! Advantages of going via the SPA are that we will vaccinate the dog and do the paperwork etc, and if you want him/her castrated/sterilised, it tends to be much cheaper via a refuge, as they get a good rate at the vets. However the other route is perfectly legal! In refuge news, another fabulous adoption today, that of Tesson, who is eleven years old and has been at the refuge since May 2012. He was but one of several elderly German Shepherds at the refuge, and we are delighted that he has found a home. His adopter selected Tesson several months ago, but was unable to adopt him until his own dog passed away, so whereas we are happy for Tesson, we know that his freedom is only due to the death of a much loved pet. Bitter sweet. We wish him a long and happy life and hope that our other elderly German Shepherds are as lucky. Remember, we ask just 80 euros for a dog of 9 years or over, and this can include castration/sterilisation if required! Please consider adopting a golden oldie! Tesson who was adopted today!